When the Pixies reunited for a tour back in 2004, the college rock legends took the opportunity to release a career-spanning best-of set entitled Wave of Mutilation. Now, close to seven years later, 4AD will finally be giving that compilation a vinyl release. The 23-song set will be released as a double LP on January 17. 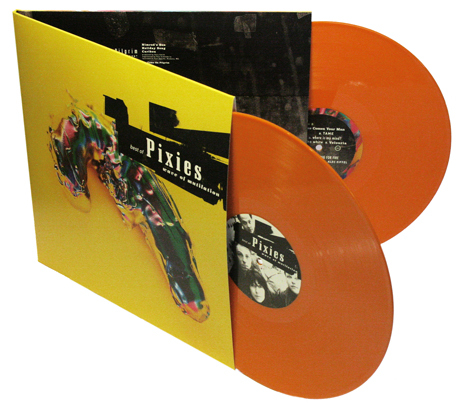 The first European pressing will be on orange vinyl (as pictured above), while the North American release will be black. It will be packaged in a gatefold sleeve. The compilation features singles and key album tracks, along with two stand-out B-sides, "Into the White" and "Winterlong." If the Pixies' Minotaur box set was a little to pricey for your budget, this double LP is the next best thing. See the tracklist below and get pre-order information here. UPDATE: According to the label, it will be importing a "very small quantity" of the British orange vinyl for Canada. 3. "Monkey Gone to Heaven"
1. "Here Comes Your Man"
3. "Where Is My Mind?"